A controlled test utilizing a new, state-of-the-art measurement system indicates that machine learning makes advertising more effective by identifying and targeting people who are most receptive to the campaigns. 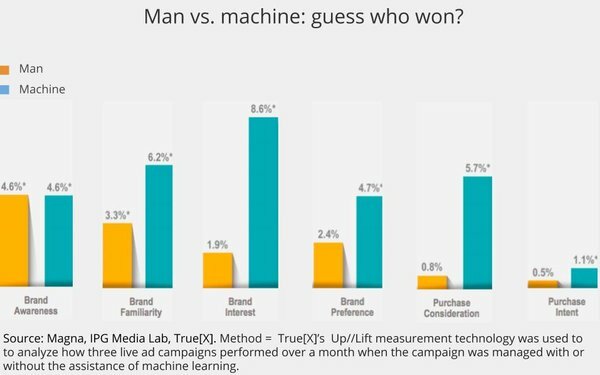 The study -- conducted by IPG Mediabrands’ Magna and IPG Lab units in partnership with 21st Century Fox’s True[X] subsidiary -- utilized True[X]’s Up//Lift measurement technology to measure three campaigns over a month to find out which performed better: campaigns managed with or without machine learning. Purchase intent (machines: +1.1%, humans +0.5%). The study also found that machine learning was more economical, with only 3.08 ad exposures per consumers vs. 4.13 generated by humans required for brand recall.